As exciting as an award-winning action film, this novel opens with a child’s life being torn apart before her eyes and ends in an unexpected, satisfying way. The protagonist, Adria Caskey, is a strong woman whose job it is to protect lives. Partners with her grandfather in the protection business until his recent death, Adria now has one final promise to fulfill to her grandfather before she officially closes the doors to the family business. Her staff of security specialists is made up of strong, talented women who are like sisters. There is implicit trust among them that supersedes the need for them to speak to each other at times. No one is happy to have the business close. For some, it is the only thing they know and they do not know how to move on. Adria’s final client, Peter Dragon, unknowingly has ties to Adria that span their lifetime. She and her staff of executive protectors must be at their best in order to see this case to a successful conclusion. Sylvie Kurtz has an amazing ability to describe a scene so that you feel you are in the action and not simply reading words on a page. You can smell the aroma of fresh pasta sauce so strongly that your taste buds engage. When a character’s teeth chatter due to a recent douse of ice cold water, so do yours. And when Adria is completed exhausted from having been on the run, you feel her disorientation. 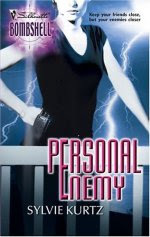 Personal Enemy is a gripping thrill ride that any fan of strong action, female leads, and good mysteries will enjoy. You will feel like you’re in the passenger seat during the high-speed chases, and you’ll find yourself ducking when the bullets start flying. This book is a thoroughly engaging read.